Lady Kita?… Lady silly faces! You silly little one: spring cleaning! So mum is still springing and cleaning and some times she does not want my help! I’m of good service though. 😉 But if I get a buffalo-skin-chewing-bone, I forget helping immediately! Grandpa understands, he says. But he says I still have to learn to chew as a lady! He can not stop laughing with all my silly faces he says! he says I start civilised but it gets worser and worser… He said he would get a laughing-illness one day, looking at me chewing! Mum saw it too and got the blinking thing of course. She says this is a real fototoot, as they make for fashion magazines. Grandpa grouched I can call myself happy there is no magazine for silly faces! Gggrrr. He always has comments! Since short I have a cousin over there too! A little gentleman of about 5 months old now, I think… difficult counting the months with all these puppies around… and time goes fast! His name is Sunny. At the – even faster – same speed this bandit-guy was taken to the green clothes for SURGERY! He got a zipper, bone came out and put far away so he could not find it when he woke up, hahahaha! He could go home a few hours later… And did heal very quickly! 😉 What he does is in speed-tempo! Well, my mum is very pleased I don’t have a big zipper yet from swallowing something… 😉 Mum and dad of uncle Apollo, auntie Pim and cousin Sunny are very, very happy to have some super-efficient and caring green clothes: they are the ones writing the happy ends at this thrillers! Mum and dad Van ’t Asbroek joke about it: we should take a subscription at the green clothes for ten surgeries with the eleventh for free! Thriller-series!… Surgery in ‘double’: part 2 and part 3! Told you yesterday about my uncle Pol! That was already very scary! Wait till you hear this! There also is my aunt: Pimpernell van ’t Asbroek. Auntie Pim (for friends and family) is a special lady, my dogness, she is! She went to see her big lover ❤ , she wanted babies, you know! 😉 🙂 That was in the month may! Big wonder 🙂 , auntie was pregnant and echo showed pups were allright! In this case, new risk to take… another SURGERY! Few days before she should give birth, pups are born with a caesarean operation. Green clothes were afraid the other zipper could unzip, that was not necessary. So now my auntie Pim has 8 beautiful and healthy pups ❤ and… 2 zippers in her belly… 🙂 Pups are born on the 11th of july, that’s the flamish ‘national’ holiday. Isn’t she a very brave lady??? Told you I’m from a very special family!!! New thriller-series!… Surgery, part 1! So: SURGERY! Panic: will this go alright, at his age?!!! Lots of paws were crossed, all the family helped! Green clothes found what caused the stain! The old bandit fooled everyone! No cancer! A part of an old ball, swallowed weeks and weeks before cause partly digested… but those rests caused the problem now. These warm summerdays? One good thing about it! We go to the dogpark in the morning, when it is still rather fresh and we stay there for a long time! So, we meet lots of friends, our “summerfriends”. Mum has this friend, a very good friend for a very long time! They met at boarding school wwhen they were 12 years old… So they know each other for more than 40 years. Grandpa says she was already there when he came and her grandpa-dog became 16 years old before going to the bridge! Anyway, mum’s friend is at the Belgian coast for a month every year. She likesthe beach and spending time there! At the beach, there is this custom, excisting since ever! Children make paper flowers, collect shells and start their shop! They buy and ssell flowers. Money? The shells! I have these very nice and enthousiastic American fans in Berlin. Yes, yes, they are from Michigan but now they live in Europe, in Berlin in Germany! And you know what? 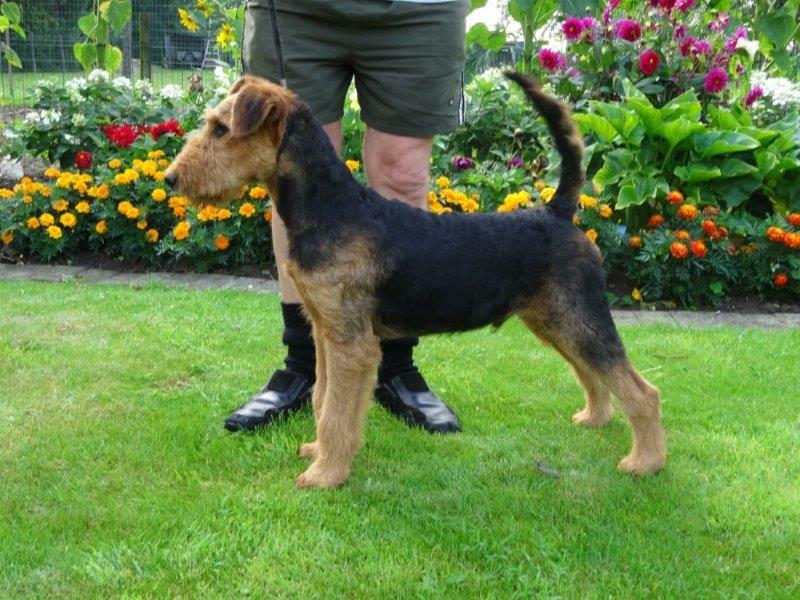 Since a few days they have Islay, a little airedale girl. She is ten weeks old now and just arrived with her new mum and dad. I looked at the pics, together with my mum: not once, but several times! Islay willbe a city-girl just like me! She’ll be a real city-lady, in a city bigger than mine! Oh waaauw!! And then I got a little curious. Mum, tell me… Was I as little as little Islay? Mum thinks I was smaller at that age… Mum, show me pics, will you, of me at ten weeks? Mum said she would search on her computer. I arrived at seven weeks, so mum did some counting to ten weeks and found some pics. What do you say, mum? Was I a naughty little one at ten weeks? What was it about that wallpaper-story? Oh, I see it on the pics. My dogness, that was not me, mum, impossible! Mum laughs! And I was not playing that much with toys but I was annoying grandpa? Hahaha, grandpa, you hear this? Well, little Islay, live your life as it is meant to be: healthy and happy, warm and active, curious and lazy, naughty and brave, stubborn and gentle… live it in the real airedale-city-lady-spirit! Mum, why are there no friends in the dogpark? We have holidays, why don’t they come? What does she say? Maybe they have no holidays? Mum, really, I don’t know what you are talking about! What does it mean “apporteren”? Oh, you throw the toy and I fetch it and I bring it to you?? Do you think that I think that is a good idea? Bring it to you? If the toy is for me, why should I bring it to you? Explain me that! Oh, you will throw it again? What for? To fetch it again and bring it to you? Okay, she throws. I’ll run after it! Now she calls me, I go to her, without the toy! Seems not be how it should be, I go back to fetch the toy. Now I run to mum. Sit, Kita! Sit! In the hand! Ohohoh, she has a treat? I sit. And then I give the toy in her left hand, I get the treat from her right hand! Mum is very pleased! Very pleased! She throws again? Think this must be the same procedure! Okay: run, fetch, run, sit, give it, treat. Think I like it a bit. ❤ Again and again, even without treats! And again… 6 times! Mum, this is enough! Enough is enough, this toy is mine! I stay here. What do I see? A little friend entering the dogpark? YES!